The 2019 Sauk County Earth Day Celebration event marks the 20th Anniversary of this event. We've moved to the VFW in Prairie du Sac for out next event. Join us, we have Seeds of inspiration for you. 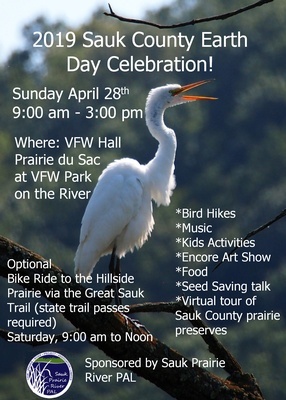 Family friendly, the Sauk County Earth Day Celebration brings together organizations and individuals who celebrate the great outdoors. Come spend the day with us. We have hikes, presentations, fascinating displays, the Encore!! Art show, the Kid's Corner, pie AND a local author! Read more on our website.